Moving house is one of the most stressful events in life. In the midst of the craziness of packing boxes, organising removalists and connecting your utilities, take some time to consider how stressful the situation can also be for your pets. With some forethought and consideration there are easy steps you can follow to help your pet transition to their new environment. We’ll be focusing on our feline friends here but keep an eye out in the future for our article on moving house with your dog. Cats are territorial by nature and will have marked their home environment with their scent so it can be a bit unnerving to suddenly be in a new house that doesn’t smell like ‘home’, even more so if there are scents from other cats around. In your new house, thoroughly clean the area your cat will first move into to remove any former smells, this will make the transition process a bit easier. It’s important to note that some cats will take the move in their stride, but as all cats have different personalities it’s really up to you to tailor the move to suit your cat and make the change as smooth as possible for them. 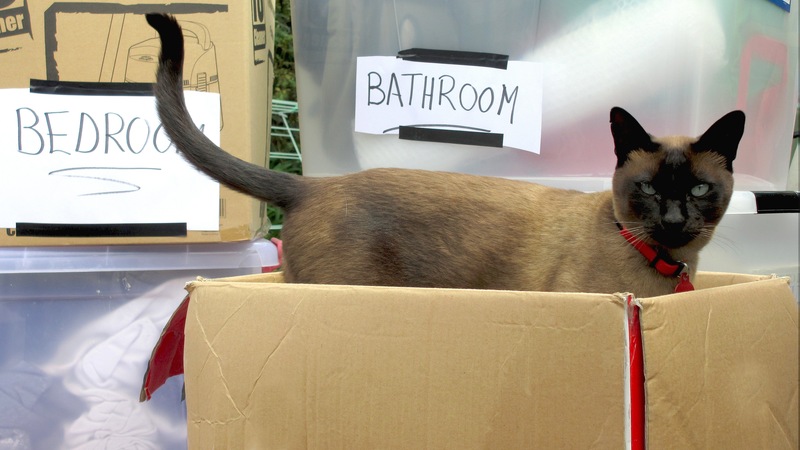 Packing: Cats can easily be upset by anything that is out of place in their environment, so the sudden appearance of packing boxes and furniture moving can confuse and stress them. If possible, when you are packing up the house leave one room to last and allow the cat to stay in there so it feels safe and comfortable. In transit: Secure your cat in a carrier and take it in the car with you. If your cat is a nervous traveller you can seek advice from your veterinarian prior to the move about possible treatments. You may want to consider leaving your cat with a trusted friend on the day of moving and only introduce them to your new house once all the major moving activity is over and the house is secure. At the new house: When you and your cat arrive at the new house confine the cat to only one secure room until you have finished unpacking. Ensure they have access to food, water, litter and their favourite blanket or bed to help them feel at ease in the new home. If you are relocating more than one cat, keep them together as they may help comfort one another. Leave the cat carrier open in the room with the cat in case they want a place to retreat to and hide. It may take a while for your cat to venture out into the other rooms of the new house, but always remember to give them constant praise and attention during the adjustment period. Try to stick to your normal routine of feeding, petting and play, and always leave food and water close by. They may not want to eat for the first day but their appetite will quickly return. If your cat spends some time outdoors, check the area first to make sure it’s safe for them but keep them inside for the first few weeks to let them really become familiar with their new home. Most importantly, ensure that you have updated your contact details with their microchip register and ensure other appropriate identification is in place such as a collar tag with your name and number engraved, as well as a free National Pet Register ID tag. Remember to register your pet with your local council and learn about their laws relating to cats – many councils in Australia impose cat curfews at night. With a well thought out plan you can help your cat to transition easily into their new home.